Biotinylated Human CEACAM-8, His Tag, Avi Tag (CE8-H82E9) is expressed from human 293 cells (HEK293). It contains AA Gln 35 - Ser 319 (Accession # P31997-1). The protein has a calculated MW of 35.1 kDa. The protein migrates as 55-66 kDa under reducing (R) condition (SDS-PAGE) due to glycosylation. 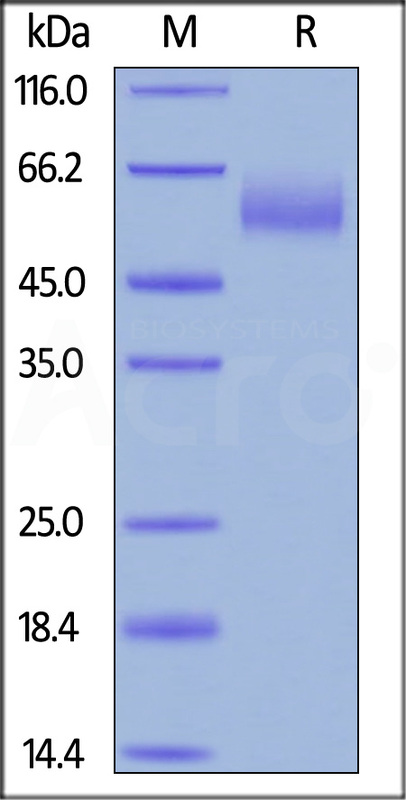 Biotinylated Human CEACAM-8, His Tag, Avi Tag on SDS-PAGE under reducing (R) condition. The gel was stained overnight with Coomassie Blue. The purity of the protein is greater than 95%. Immobilized Human CEACAM-6, His Tag (Cat. No. 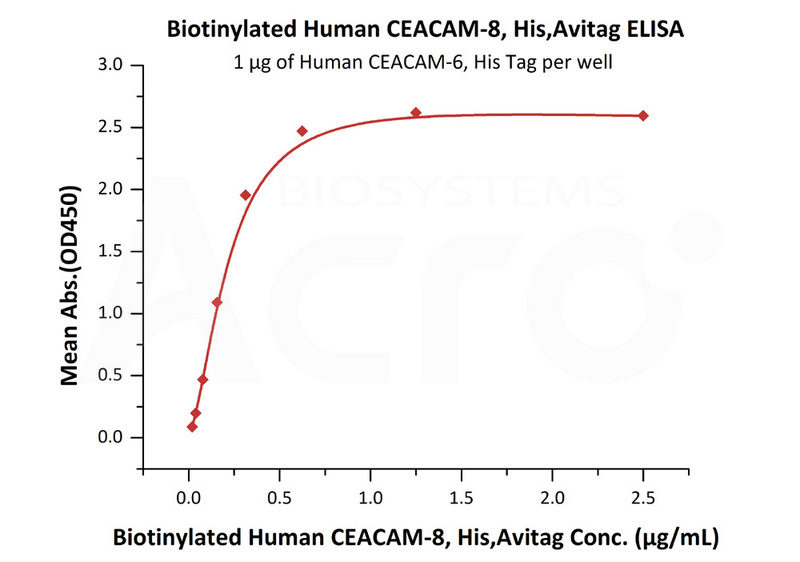 CE6-H5223) at 10 μg/mL (100 μL/well) can bind Biotinylated Human CEACAM-8, His Tag, Avi Tag (Cat. No. CE8-H82E9) with a linear range of 0.02-0.313 μg/mL (QC tested). Carcinoembryonic antigen-related cell adhesion molecule 8 (CEACAM8) is also known as CD66b (Cluster of Differentiation 66b), CD66b, CD67, CGM6, NCA-95, and is one of seven human CEACAM family members within the immunoglobulin superfamily. CEACAM family members are a set of widely expressed proteins involved in several biological functions, including cell adhesion, migration, signal transduction, and the regulation of gene expression. Abnormal overexpression and downregulation of some CEACAMs have been described in tumor cells. In humans, CEACAMs include type I transmembrane proteins (CEACAM1, CEACAM3, and CEACAM4) and GPI-linked molecules (CEACAM5 through CEACAM8). There is no human CEACAM2. CEACAM8 is a single chain, two Ig-like C2-type (immunoglobulin-like) domains and one Ig-like V-type (immunoglobulin-like) domain. It is an activation marker for human granulocytes. (1) Oikawa,S. et al., 2000, Biochem Biophys Res Commun 278 (3):564-8. (2) Lasa,A. et al., 2008, Ann Hematol 87 (3):205-11. (3) Ramachandran P, et al., 2006, J. Proteome Res. 5 (6): 1493–503. (4) Zhao L, et al., 2002, J. Immunol. Methods 270 (1): 27–35.